Saying NPE has accomplished a feat only 1% of its applicants achieve, Inc. magazine has named NPE Group, LLC. 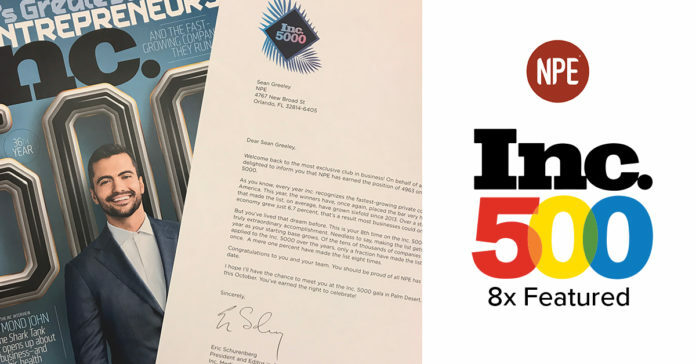 to its Inc. 5000 list of fastest-growing privately held companies for the eighth consecutive time, the magazine announced Aug. 15. “This year, the winners have, once again, placed the bar very high,” said Inc.’s President and Editor in Chief Eric Schurenberg. “Companies that made the list, on average, have grown sixfold since 2013. Over a stretch when the economy grew just 6.7 percent, that’s a result most businesses could only dream of,” Schurenberg said. NPE is a fitness business coaching company founded in 2006 with offices in Orlando, FL, London, UK, and Sydney, Australia. In its 11 years of serving fitness business owners, NPE has grown rapidly enough to earn spots on eight yearly Inc. 500/5000 lists, from 2010-2017. There are approximately 5.84 million privately held companies with employees in the U.S., according to the U.S. Small Business Administration. “This is [NPE’s] 8th time on the Inc. 500/5000, which is a truly extraordinary accomplishment,” said Schurenberg. “Needless to say, making the list gets harder every year as your starting base grows. Of the tens of thousands of companies that have applied to the Inc. 5000 over the years, only a fraction have made the list more than once. A mere one percent have made the list eight times. Inc. 5000 measures the three-year revenue growth of privately held, for profit, and independent companies. Qualified companies must have had at least $100,000 in annual revenue in 2013 and $2 million in 2016, and the 2016 number must be higher than 2013. For this year, NPE ranked #4,963. “You should be proud of all NPE has achieved to date,” Scherumberg said in a congratulations letter to NPE Founder and CEO Sean Greeley. NPE has served more than 28,000 fitness businesses in 96 countries over the past 11 years. It has more than 50 employees worldwide. NPE believes that even the best coaches need coaches. Unlike simple online courses, marketing agencies/services, and mastermind groups that serve the fitness industry, NPE’s business coaching programs are the only ones that dig into the real numbers to drive long-term success and stability in business. Fitness business coaching includes one-to-one and group coaching, online education, tools and templates, technology, live events, and a supportive community that empowers business owners to grow.